Subjective health Archives - Seven Countries Study | The first study to relate diet with cardiovascular disease. Self-rated health, disability and depressive symptoms were independent from each other, and were associated with all-cause mortality in elderly men from Finland, The Netherlands and Italy (the FINE study). After adjustment for the prevalence of chronic diseases severity of disability and depressive symptoms remained related to all-cause mortality. For the combination of disability and self-rated health a 3-fold greater mortality risk was observed for men who had severe disability and a poor self-rated health compared to the reference group. Men with severe disability in the two highest categories of depressive symptoms had also a 3-fold higher mortality risk. These results suggest that for adequate prognosis of mortality and for developing intervention strategies information is needed on other and different health outcomes. Self-rated health was strongly related to all-cause mortality after 5 and 15 years of follow-up. Physician-rated health was an independent predictor of 15-year all-cause mortality. Self-rated health predicted cancer mortality and physician-rated health predicted cardiovascular mortality. Self-rated health provided information beyond physican-rated health and may help clinicians to optimize the decision-making surrounding treatment, hospital referral and follow-up visits to achieve “patient-centered care”. Self-rated health has been identified by the American Institute of Medicine as one of the 20 key indicators valuable in measuring health of populations. 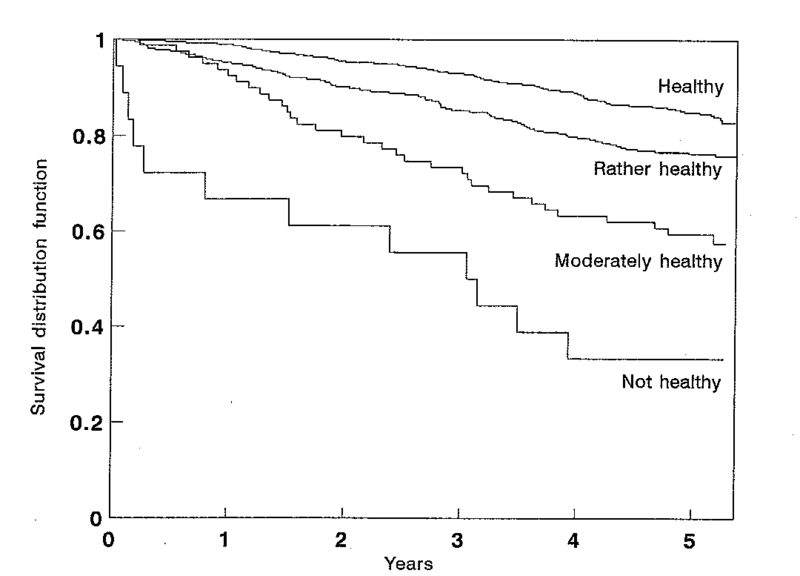 In 1985, self-rated health was measured on a four-point scale in the Zutphen Elderly Study. Physician-rated health was evaluated with a five-point scale. Quality of self-reported measures of functional status. In the Zutphen Elderly Study, self-reported functional status was measured with the self-administered 13-item WHO-questionnaire on Activities of Daily Living. A hierarchic disability-scale was constructed based on basic activities of daily living (e.g. walking indoors), mobility-related (e.g. moving outdoors) and instrumental activities of daily living (e.g. preparing meals). The reproducibility of the self-reported disabilities was fair to good. Performance-based measures of functional status are more objective than self-reported measures. A score from performance-based limitations was based on the results of four tests: standing balance, walking speed, ability to rise from a chair, and external shoulder rotation. Three of the four performance tests were highly reproducible, the shoulder rotation test was not.